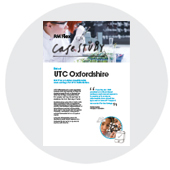 Why did UTC Oxfordshire choose RM to provide their IT support? UTC Oxfordshire is a new specialist science and engineering college for students aged 14-18. In September 2015 the College welcomed their first pupils, 150 Year 10 and Year 12 students, for their first day of term. Based in brand new, state of the art facilities in the heart of Oxfordshire, the UTC are committed to helping their students gain the qualifications and experience that their future employers will demand by combining core academic subjects with the opportunity to study and gain practical experience in specialist areas. Over the next two years the school will increase their intake to 600 pupils at capacity. "From the start, RM provided us with unbiased evidence and relevant expertise to enable us to make an informed decision about the type and volume of IT support we needed for the College. What I hadn't fully comprehended is that we currently have the pupil numbers of a primary school but the technology of a secondary school. We needed significant technical expertise but on an ad-hoc basis. As the school grows over the next three years, we will scale up the level of support as required. The Flex service provides us with considerable cost savings compared to directly employing a full-time network manager. I had a dawning realisation that many of our issues can be resolved remotely by RM, so we really don't need someone in the College all the time, and this contributed to how we structured the service now and for the future. As Principal I was having to juggle many things at the start of term, and it was reassuring to know that I had the backing of a company I could trust to resolve any ICT issues. RM clearly communicate the hierarchy of the service we have, and it's great to have a single point of contact with our Relationship Manager. If I only want to deal with one person I can, safe in the knowledge that my messages will be cascaded effectively down to the team. Knowing the roles and capabilities of my Operations Manager and Support Engineer, I can go directly to them when it's relevant because and they work so closely with Silvana (our Relationship Manager). I have no hesitation in recommending the RM Flex service and have already facilitated conversations between RM and two other schools who are currently experiencing IT issues as I firmly believe that RM will benefit their schools too. We are looking forward to continuing a long-term journey with RM."